The quilts in the show at QuiltCon were amazing. There were so many great quilts, and quite honestly, any and every single one of them could have received a ribbon for one reason or another. I feel like a lot of people are hesitant to submit quilts to shows, especially juried shows for fear of being rejected and not juried into the show, or not winning. I thought I'd share my two cents on the topic. 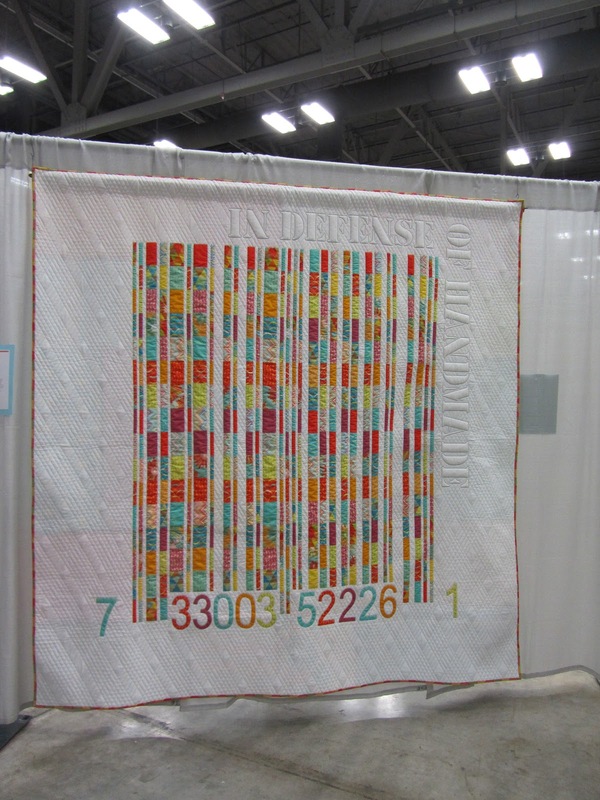 I submitted two quilts into QuiltCon and one was accepted into the show. I felt honored to have my quilt in the show with so many other great quilts. It was fun to have people talk to me about my quilt and the other quilts. I even got a big hug from Mary Fons when she found out I made the Dazzling Diamonds quilt in the show. I didn't submit my quilts expecting to win. And guess what? I didn't place in my category and I'm still extremely proud of my quilt. I had several people tell me that they thought my quilt should have won, and my response was that I was flattered, but the winning quilts were also very beautiful and very much deserved to win. 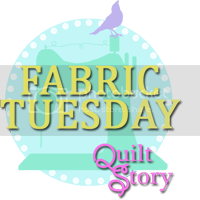 The beauty of quilting is that we all have a variety of styles and ideas. For some people orange is their favorite color. It's my least favorite color. I quilt what I like, and that's the most important thing to me. I can only imagine how difficult judging a quilt show is and I have a deep respect for those that have to do it and a deep respect for the decisions they make. You may not agree with their decisions, but often times you have a chance to cast your vote in a viewers choice category. So, as I get off my soapbox and show you the quilts, I just want to encourage everyone to submit quilts to shows if they want. Don't be afraid of rejection or not winning. If you love something, chances are someone else will. But remember that there are things that might not be your style, just as what you create might not be someone else's. Just don't take it personally. And, as you're walking around viewing quilts at shows, remember that there's a person out there that made and love each quilt in the show. Here were the 1st and 2nd place Modern in Miniature quilts by Catherine A. Redford and Charlotte Newland. This quilt by Victoria Findlay Wolfe won best in show. I was so happy to see this quilt in person. I've admired it online and it's my inspiration for a bee quilt I'm making. 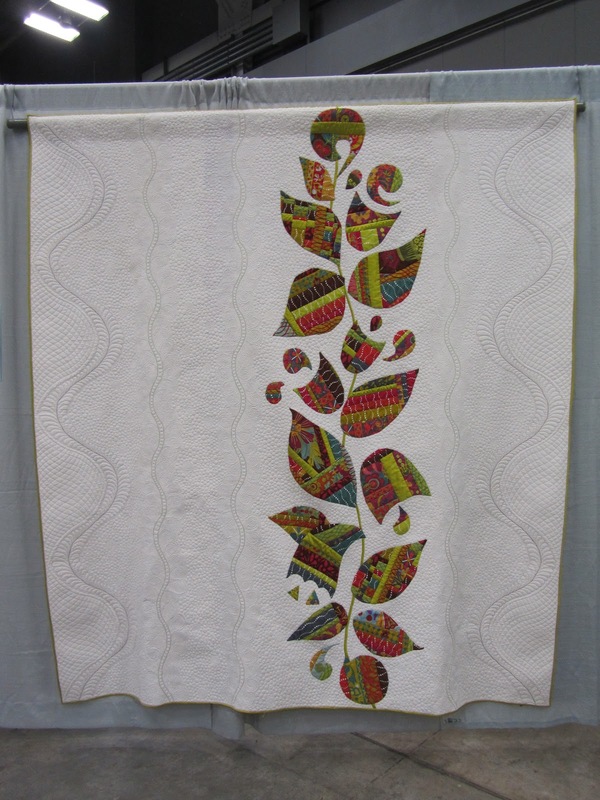 This quilt by Karen Anderson-Abraham won the quilting excellence award. I love HST quilts and this one by my new friend Jessica Pierre'auguste was beautiful. 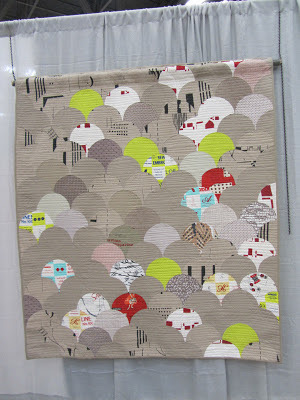 I love lime green, which meant it was no surprise that I loved this houndstooth quilt by Leslie Lamb. 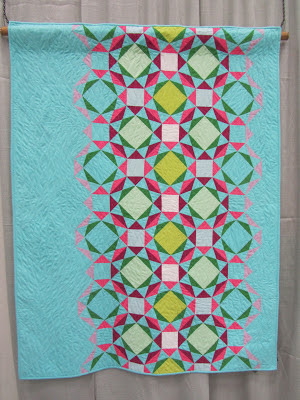 As a paper piecing fanatic, it's no surprise that I love this quilt by Susan Strong. I am absolutely in LOVE with the colors Katie Bickesley used in this HST quilt. Don't be surprised if you see me make something in these colors some day. 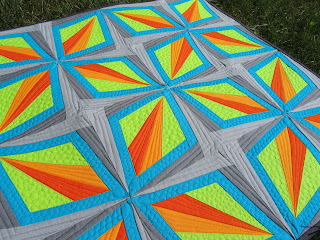 My love of color means I obviously love this quilt, which was pieced by Jim Smith and Andy Bunhammer. When I first saw it, I thought it was a stack and whack quilt. This was a great quilt by Thomas Knauer. The quilting was awesome too! 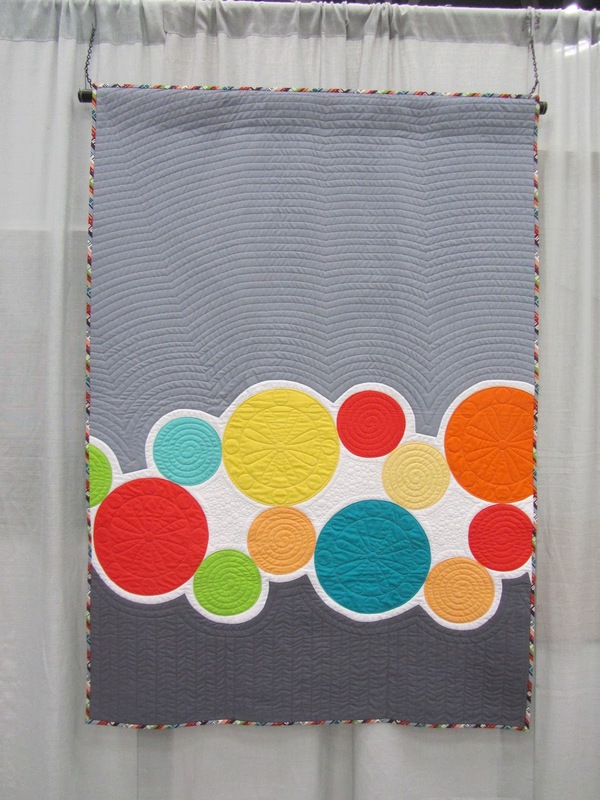 I love the low volume and mix of prints in this quilt by Latifah Saafir. 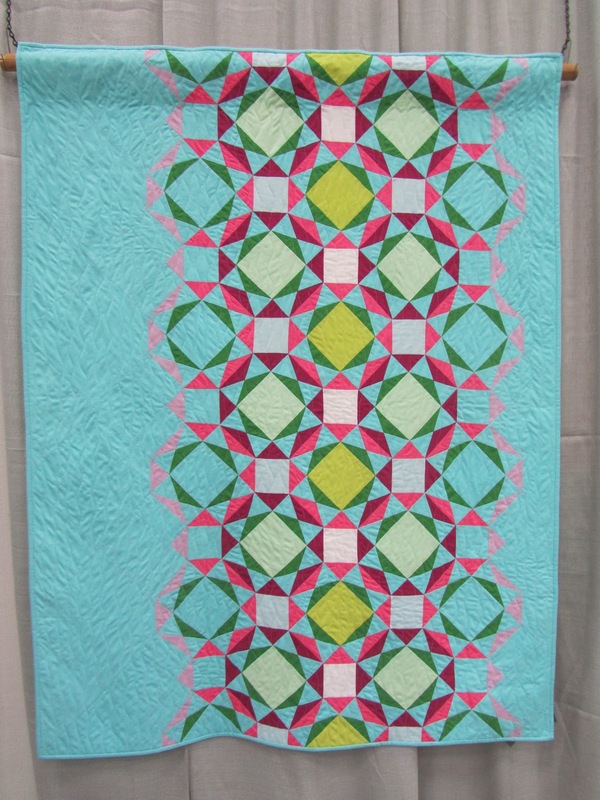 I love both the colors and design in this quilt by Katie Pedersen. I really like the pattern of this quilt by Lee Heinrich. This is such a happy quilt by Janet McWorkman. 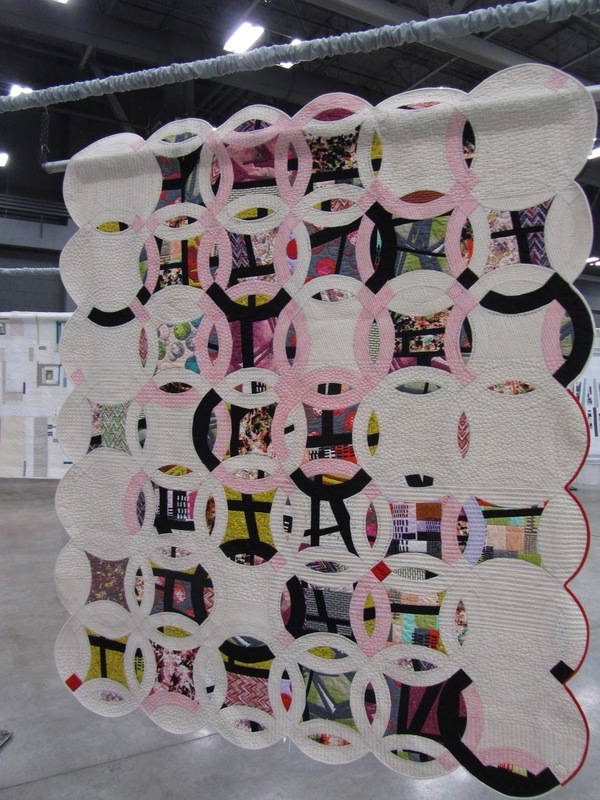 And finally, this quilt by Alison Glass won viewers choice at QuiltCon. 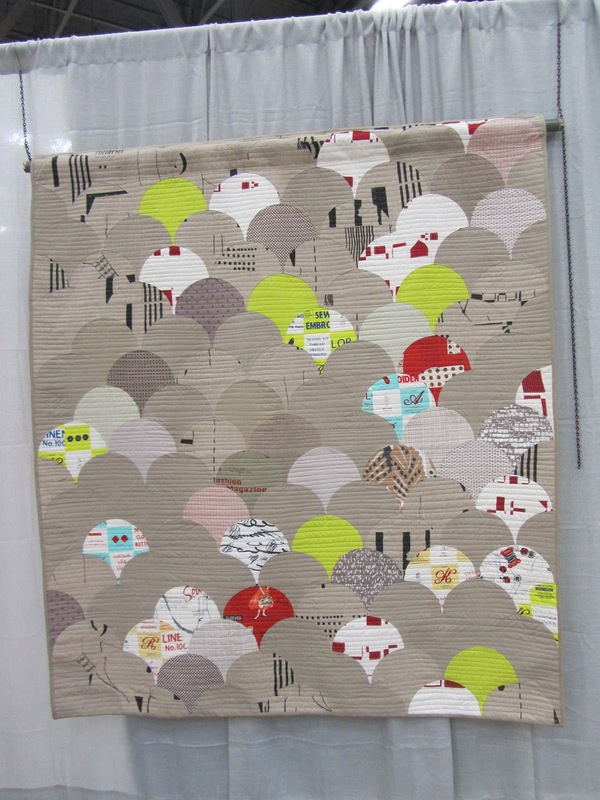 There are a bunch of other blog posts with other quilts from the show, so be sure to check them out. Oh, and stay tuned for a giveaway with some loot I snagged at QuiltCon. Well, I'm pleased to say that I have finally finished my one block wonder quilt, which I am dubbing "Tropical Delight" this month - more than five years after I made the top! With all this snow we've been receiving here in New England, a little bright, tropical inspired quilt can certainly bring a little happiness to an otherwise white and brown landscape. I used a yellow Oliver & S Modern Workshop print for the binding that I had in my stash. The top was pieced with fabrics that I got from Joann's a while ago. I'm pretty sure I was actually still in college, so it was probably 7-9 years ago. The back is not my usual one fabric backing. The floral you see here is the same fabric on the front of the quilt, just not all chopped up. I quilted this one using an Angela Walters inspired floral design in a green So Fine! thread. I'm very glad to have this one all finished - my goal as part of the "A Lovely Year of Finishes" challenge. 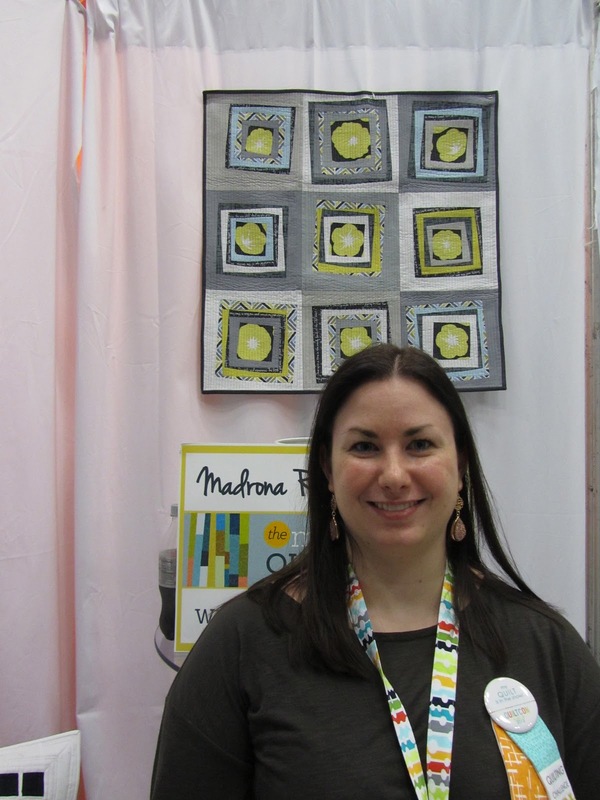 Well, QuiltCon officially wrapped up yesterday and it was one heck of a show. Day four consisted of several lectures that were very interactive and talked a lot about the Modern Quilt Guild as a whole. 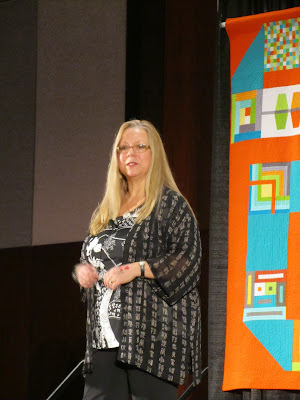 After checking out of our hotel, we went and saw Mary Fons talk about the future of quilting. She was such an engaging, entertaining and passionate speaker. I really enjoyed what she had to say. This was followed by a lecture on color by Luana Rubin. At this point, it was all MQG focused. Alissa Height Carlton talked about all of the changes and events for the guild. We then listened to two panel discussions on guilds, and the most interesting, various activities guilds can participate in. I took a lot out of the last panel and came away with some great ideas for the Boston MQG. It was then time to head to the airport, where our flight was delayed and I didn't end up getting back to my aunt's house until after 2am. I'm all inspired to quilt after spending four days talking, seeing and hearing all about quilts. 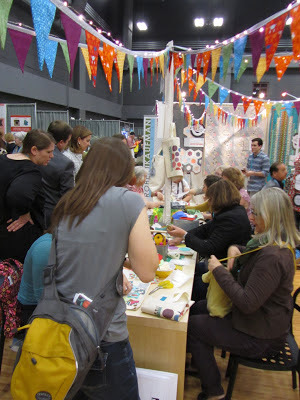 Yesterday was another amazing day at QuiltCon. It started with meeting the awesome Violet Craft, the designer of Madrona Road for Michael Miller. We chatted for a while about her line, the industry and the recent Madrona Road competition. 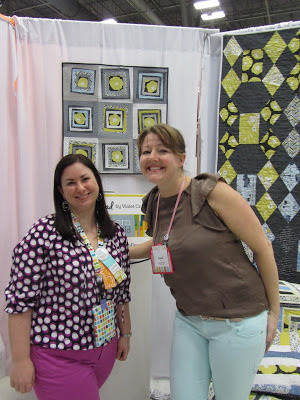 Here we are with my quilt that is hanging in the Michael Miller booth. I took some time to check out the quilt show after. This quilt by Victoria Findlay Wolfe won best in show. I'll do a separate post after the show dedicated to all of the amazing quilts. Then it was time to listed to a lecture by Heather Ross. And after a quick lunch at a local Tex-Mex joint, it was time for a lecture by Anna Maria Horner. The last lecture I attended before doing a little shopping was a panel discussion on publishing your work in magazines. We had a little Texas BBQ for dinner and went to the 80's dance party. Talk about another amazing day. I'm excited for days 3 and 4. I'll be attending more lectures the next two days, which I'm really looking forward to. Stay tuned for more details from QuiltCon! Well, I'm sitting bag in my hotel room after a long but wonderful first day at QuiltCon. It started with a 4:20am ET wakeup call to catch our flight to Austin. Once we got here, it's been full steam ahead! First things first, I had to stop and check out my quilts. Here's my Dazzling Diamonds quilt. I'm sporting an awesome ribbon letting everyone know I have a quilt in the show, which was made by the awesome Elizabeth Hartman. My next stop was the Michael Miller booth to visit my Wonky Road quilt. The folks at Michael Miller were so friendly and I really enjoyed meeting them. With just a little bit of time before several lectures started that we wanted to see, I had a chance to check out a few of the exhibitors. The Robert Kaufman booth had an activity for attendees to design their own tote bags. There was a line at the Spoonflower booth for a chance to win some fabric. By this point, it was time to hit the lectures. First up for us was Yoshiko Jizenji on Asian Creation: From Tradition to Modern. 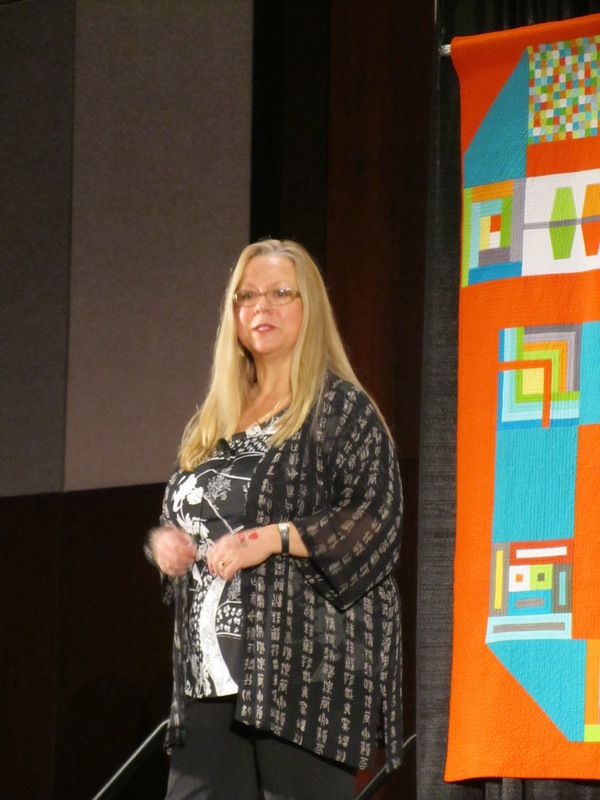 Next up was Heather Jones talking about where she finds inspiration for her quilts. I always love to see how people design quilts and where they get their inspiration from. It was a pleasure to hear Heather speak. Finally, we heard a great panel discussion led by Alissa Haight Carlton on publishing your first book. I really enjoyed this lecture and found it to be incredibly insightful. I'm excited to see what Day 2 has in store. I haven't even had a chance to look at all of the awesome quilts on display or shop the vendors. Don't worry, I'll be sure to visit the vendors and do a little shopping - right after I check out all of the other awesome quilts on display. 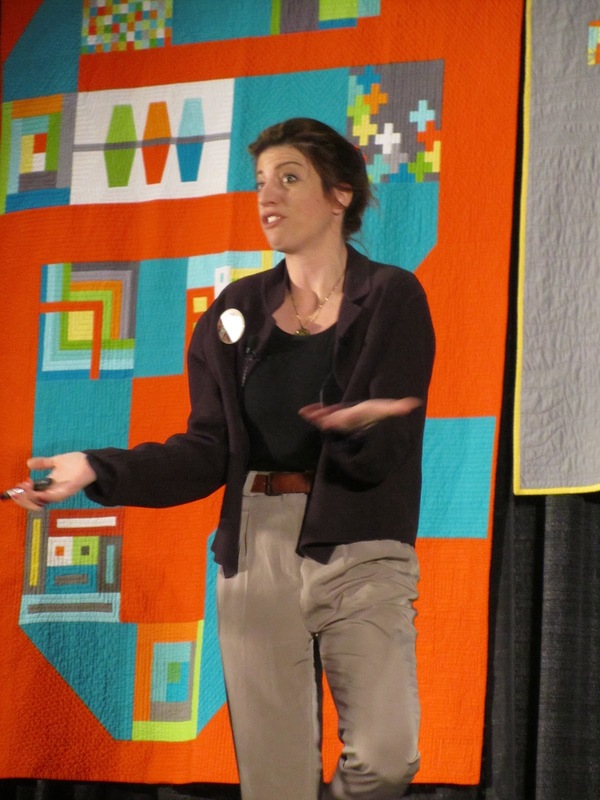 If you want to see live pictures from QuiltCon, I've been posting a ton to Instagram. 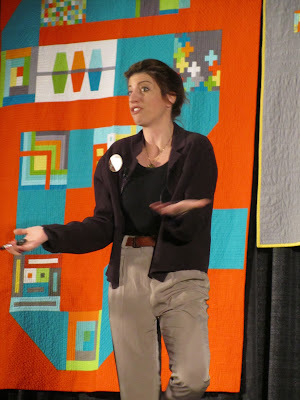 I'm off to QuiltCon bright and early tomorrow morning. I'm going to try and post to Twitter, Facebook and Instagram throughout the event. I'd like to try and blog about it during the event, but depending on how tired I am at night, that might have to wait until next week. And don't forget to check out these two quilts which will be hanging at the show.